Give the gift of global flavor with this fully stocked palm leaf basket. Ideal for the adventurous entertainer, this basket is stuffed to the brim with foodie-friendly goods made 'round the world. 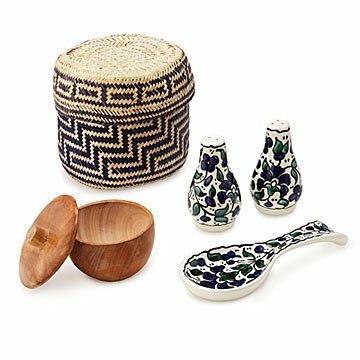 Inside, a hand-carved neem wood spice bowl made in the West Bengal region of India mingles with hand-painted salt and pepper shakers and a ceramic spoon rest from the Middle East. Housed in an intricate palm leaf basket woven by hand in Oaxaca, Mexico, each component imparts a hint of multicultural flavor and flair. Handmade by artisans in Mexico, India, and the Middle East; assembled in California. Palm Leaf Basket color and print may vary. 6" diameter x 6" H; 1.68 lbs.